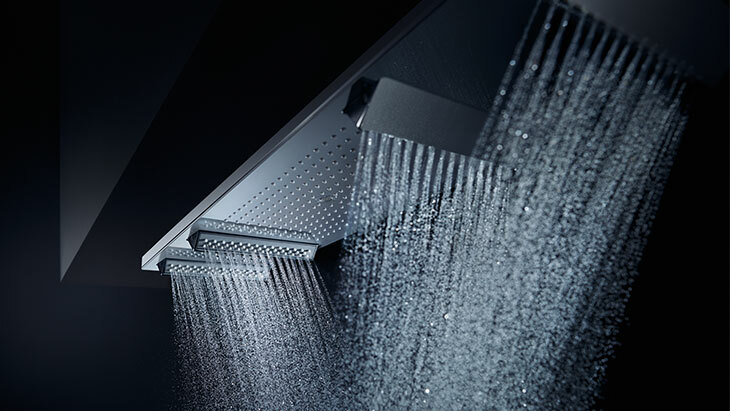 Experience AXOR Showers range on the new AXOR website. Check out innovations for the shower systems and shower sets. Whether round or square-shaped: they transform the shower into a place that you can truly appreciate. Their exceptional design and outstanding technology make them an absolute must in the shower. For example: the AXOR Shower Heaven 1200. Unique in every dimension. Its majestic size makes it the new archetype in the shower. Each of its jets is a homage to the precious element of water: ranging from revitalising water jet through to PowderRain, the latest innovation from AXOR. The finest silicone nozzles transform water into silky rain. Softly enveloping. Perfection. Square or round-shaped. Water designed to come out as a revitalising water jet or silky rain. The AXOR Showers overhead showers are available for wall or ceiling mounting and with different jet types. Perfect your own personal spa with matching AXOR side showers. The design includes purist, classic and avantgarde. Perfect functionality. Simple. The AXOR Showers showerpipes are extravagant guidance systems for the water. Overhead showers, hand showers and thermostatic mixer form one elegant unit. One example is the AXOR Showerpipe 800: also with a large shelf made of mirror glass. The showers can be controlled via two Select buttons. For example, the overhead shower with the innovative PowderRain jet. Whether you focus on the clear geometry, minimalism or familiar design: AXOR hand showers blend elegantly into any shower environment. From the minimalist AXOR Starck manual shower through to the archetypal funnel look of the AXOR hand showers designed by Front. Particularly striking: the AXOR One hand shower. A monolithic surface area with a grandiose water feature controlled via the Select button: in the form of a soft shower spray or a wide, soft band. The AXOR shower sets consist of a hand shower, a wall rod and a shower hose. Minimalistic. Timelessly modern. For example the AXOR shower set by Front: A funnel. A pipe. Together they draw attention to the hidden technology.